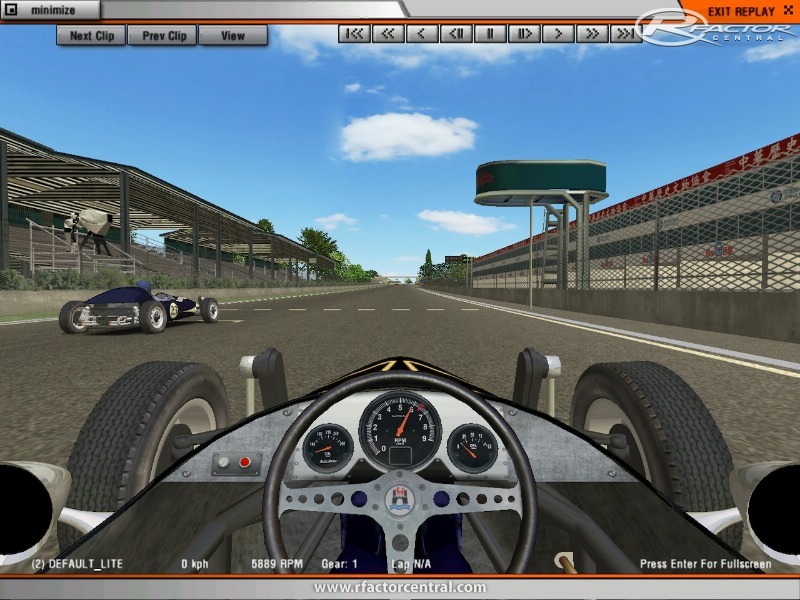 rFactor conversion by Rudy D (2010) with permission. 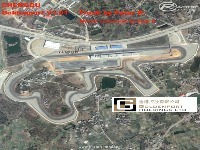 The original RaceOn/Evo/Race07 version was made by Peter K with Bob's Track Builder (located at www.weissbierbude.de), and converted with permission for rFactor by Rudy D.
A few slight additions were made for the rF version to make it a bit more authentic, like the Chinese signs on the pits instead of the generic BTB ones. Conversion with 3DSimed, done and tested on a Mac. To install, move the track folder to rFactor/Gamedata/Locations. NB: This conversion is SCREENIEWARE! 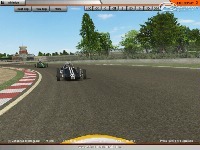 If you like it, please leave a nice screenshot of the track in action at sites like rFactorcentral or NoGrip. There are currently no setups for Chengdu, China. Add a Setup. 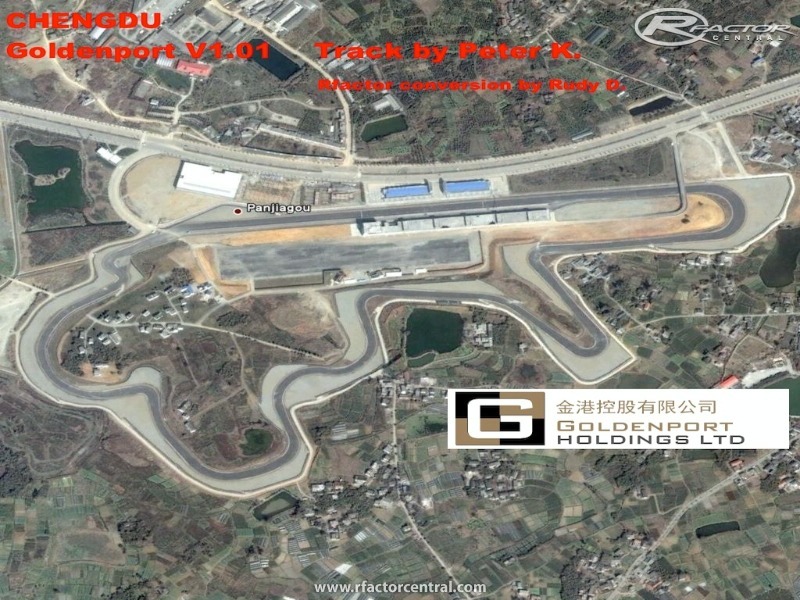 @Experienceentropy: The track is not perfect of course, it's not laser-scanned Built with Bob's Track Builder (which has its limitations) and neither Peter K. (The track maker) or I (rF converter) have been to Chengdu so it's always been a general approximation rather than an exact replica. AFAIK Peter lost the original BTB project files a while ago so the only way to improve/edit it would probably be through 3Dsimed. Thanks for the track... I am originally from Barbados by I actually live and study here in Chengdu and have driven around the track before... One of the local race teams ?????? also known as Speed Racing, is located just outside the track and I am friends with some of the racers. The track is not exactly accurate in some places (elevations changes between corner 1, 2 and 3 are much more drastic in real life) and the surface does not simulate the bumpiness. Also the pit lane light and start light do not work but we all enjoy driving it. I like the track, it's cool to drive, thanks. @ Raido1: which Mod is it, that can be seen in the pictures? Good looking track but it is not finished! A lot of cars share the same pit-box (which makes this track a bit useless) and the cam-file can be done better. On some parts of the track we can't see the cars, they are behind trees or other objects.